ECookShop is the official cookware and kitchenware website of Dawson's Department Store. 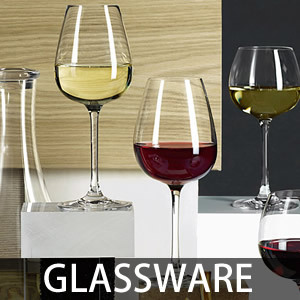 We stock a large selection of cookware and tableware, electrical goods including coffee machines, cutlery and knives, and a large selection of glassware. 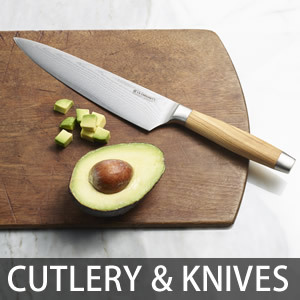 We stock products from brands like KitchenAid, Global Knives, Dualit, and many others, and we offer competitive prices on some of the best products available. All orders over �50 are delivered completely free of charge to UK addresses, and if you have any questions about the products we sell, you can call us on 01200 421010 or email and we will answer your query as quickly as possible. Alternatively, browse the website and make a purchase, or call in to the store in Clitheroe where you can see our full range of homeware, barbecues, and other items. 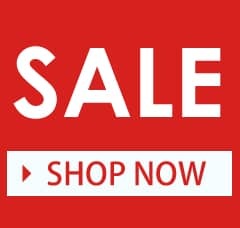 We also regularly feature sales and discounts on the products that we supply, and ensure that the kitchenware we supply arrives with you quickly. 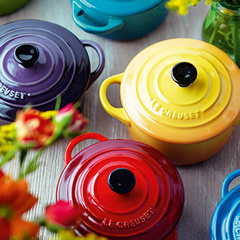 We stock a large range of Cookware and Tableware from top brands including Le Creuset, Denby Pottery, Spode, Portmeirion, Villeroy Boch and Arthur Price. 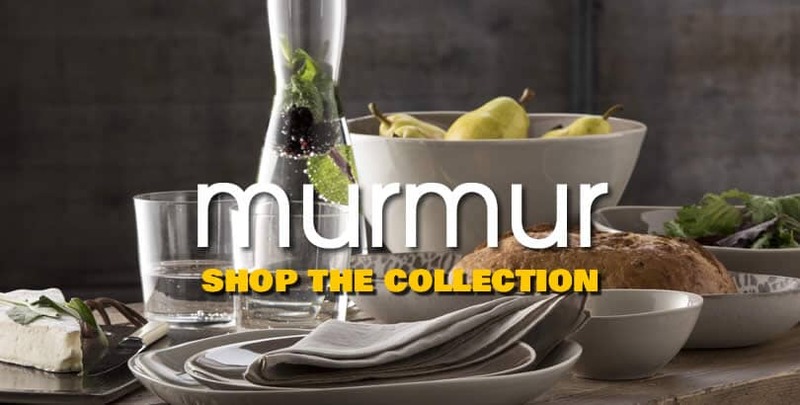 Plus cookware and tableware from top chefs Jamie Oliver, Gordon Ramsay, Raymond Blanc, Heston Blumenthal and designers including Sophie Conran and Laurence Llewelyn Bowen. 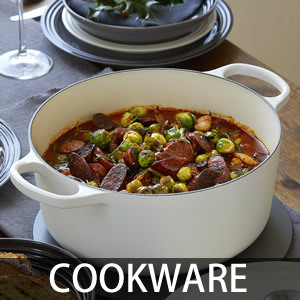 Here at Dawsons Department Store we stock a large range of cookware and tableware from the best cookware and tableware manufacturers including Denby Pottery, Le Creuset, Villeroy & Boch, Dartington, Royal Worcester and cookware and tableware items from top chefs and designers including Jamie Oliver, Gordon Ramsay, Sophie Conran and Raymond Blanc. Our department stores in Clitheroe, Lancashire and Skipton, North Yorkshire have a larger range of cookware accessories than we currently list online - all products listed online may not be available to view in store. Please contact us 24 hours prior to any visit to ensure that any product you intend to view is available in store. We'll be happy to send products over to our stores for you to view or purchase! Cookware is the collective term for pots, pans, dishes, and casserole dishes that we use to cook food and other items. Good quality pots and pans are designed to last a lifetime, while fulfilling your kitchen needs. They come in a variety of sizes and designs, so that you can purchase a full collection that includes items like milk pans, saucepans, frying pans, and woks. Each of these pans also come in different sizes and even shapes, as well as alternative designs and design types. 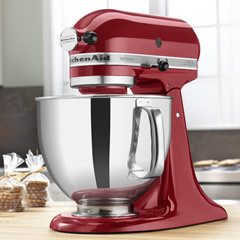 Popular brands of cookware include KitchenAid, Le Creuset, and Stellar. Choose pans according to the type of hob or heat source that you will use. This is especially important if you have an induction hob. These require that the pans be made from a ferrous or iron material in order that they can conduct the heat from the hob through the pan. 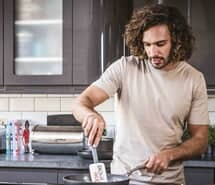 The material of the pan is also important because it will affect how long the pan will last, the type of care that it will require, and even the quality of food that you can prepare in the kitchen. Stainless steel, copper, aluminium, and cast iron are the most popular materials. Some pans are made from one of these materials, while others combine two or more in order that you can enjoy the benefits and eliminate some of the pitfalls associated with the materials used. Stainless steel is hardwearing and long lasting. It is nonreactive, which means that you can cook any type of food in a stainless-steel pan. It is also dishwasher safe, although you should always check instructions to ensure this is true. However, it has poor heat transfer and uniformity. If uniform heating temperature and thermal transfer are important, copper pans are a better option than stainless steel. Unfortunately, copper is reactive with certain alkaline or acidic foods. Combining a copper base with a stainless-steel lining offers you the best of both worlds. Aluminium is extremely lightweight. It is also affordable and has very good thermal conductivity. However, it is a soft material that can be scratched and damaged. Anodised aluminium has been treated using an electro-chemical process which hardens the material, but it will take longer to heat than other materials. Cast iron is a traditional material for cookware. It is heavy and, when treated properly, it is non-stick. 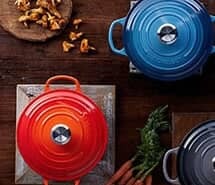 Some people appreciate the fact that cast iron imparts some of the iron flavour into the food, without being dangerous, but the pans can take a long time to heat up and cast-iron cookware usually takes more effort to clean and maintain the pans. Enamelled cast iron is an alternative to traditional cast iron and offers all of the benefits of cast iron with none of the difficulty in cleaning. Roasting trays, oven trays, Yorkshire pudding trays, and pie dishes are just some of the ovenware options available. 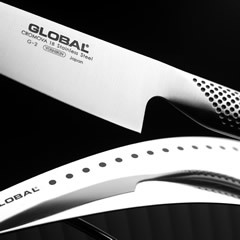 Material options include glass, which enables you to see different layers of food while cooking but can smash or crack if dropped; earthenware, which is best suited to slow cooking meals and dishes; metal, such as cast iron and stainless steel, normally lower cost than other alternatives; and silicone or rubber, which is the cheapest option and can be placed in the dishwasher for regular cleaning and maintenance. Popular brands of ovenware include Le Creuset, Denby, and Spode. Tableware is the range of items that we use for serving, eating, and dining. It includes cutlery and crockery, some glassware, and serving dishes. Although tableware is usually considered functional, some items are chosen for their good looks and as a table centrepiece. Some items, like casserole dishes are designed to be used for preparation and for serving at the table. 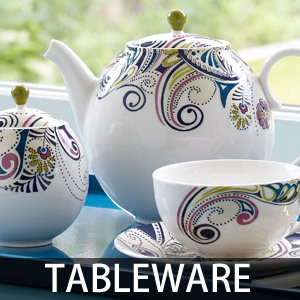 Tableware items are available individually, but it is also possible to buy partial and full sets of tableware items. 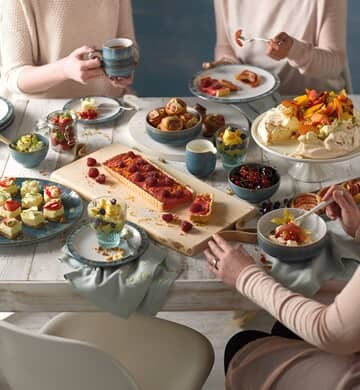 A 12 piece set, for example, might include 4 of each of small plates and dinner plates, as well as bowls and cups; everything a family of four needs when sat eating. 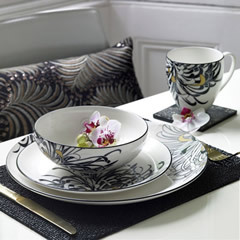 Sets are a great way to start your dining collection without having to search for every individual piece or item. The electrical appliances on our website are small appliances. 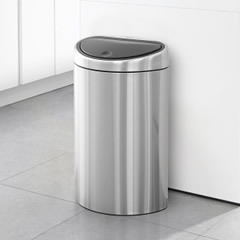 They are designed for preparing food and drinks, and as well as choosing functional items, you should choose those that are known to last and even those that look good. 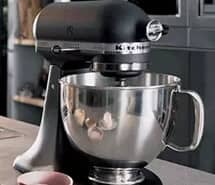 Typical small appliances include toasters and kettles, which are available separately or as part of a set, juicers, and blenders, and include items from some of the biggest names like KitchenAid, Sage by Heston Blumenthal, and Magimix. Coffee machines are a type of small electrical appliance, but their popularity and the range of these machines now available means that they warrant separate mention. Choose between coffee and espresso machines, mechanical and electrical, and opt for a design that matches the d�cor of your kitchen, because while a lot of appliances like toasted sandwich makers might live most of their life in the cupboard, the coffee machine is likely to stay out on display. 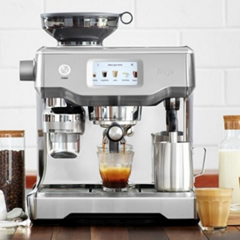 Another important decision you need to make is whether to purchase a pod machine, which is convenient but more expensive and less flexible in terms of the types of coffee you can make, or a standard espresso maker. 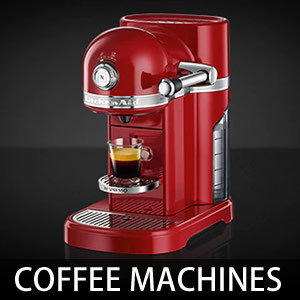 As well as Nespresso pod machines, we also stock coffee makers from Melitta, KitchenAid, and others. Cutlery is an important part of a table setting. A full or canteen set includes anywhere from 44 to 124 pieces. It typically has a display box that is used to carry or store the cutlery when not in use, and this type of cutlery set can make a great wedding or other gift. A box set includes the same items but does not usually include the gift style box. A standard cutlery set includes tables knives and forks, spoons and teaspoons, but some sets may also add items like steak knives, cake forks, serving forks and more. Choose the set according to the pieces you need and the number of each item you require, and ensure that they are made from food grade stainless steel to ensure quality and safety. 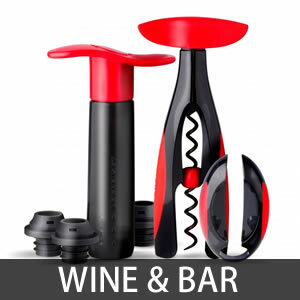 The wine and bar section of ecookshop includes everything that you need to store, serve, and consume drinks like beers, spirits, and wine. 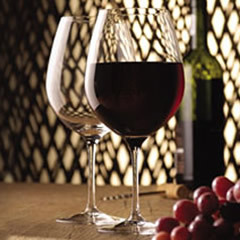 The selection of items available is equally as broad as the range of drinks available. You can also find products like cork screws and bottle openers; items that are often overlooked until you need one but don't have one. 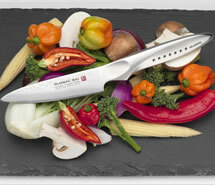 ECookShop is the official kitchenware website of Dawson's Department Store in Clitheroe. We offer competitive prices and regular discounted sales on high quality items from major manufacturers. Browse our catalogue online now. If you have any questions, call us on 01200 421010 or, alternatively, call in to Dawson's Department Store in Clitheroe to see our full range of homeware items.